The chief of a unit of the main department of the Interior Ministry in Kyiv has been handed notification of suspicion of abuse of power during the November 30 crackdown of a pro-European rally in central Kyiv, the General Prosecutor's Office has reported. "Today, the chief of a unit of the main department of the Interior Ministry in Kyiv has been handed a notification of suspicion of abuse of office, that is a deliberate action by an official, which exceeds his the powers, during the events that took place on Independence Square on November 30, 2013," the statement reads. As reported, on November 21, the Ukrainian government decided to suspend preparations for the signing of an association agreement with the EU. On the same day, people gathered on Independence Square to protest against the decision. The agreement was not signed at the Eastern Partnership summit in Vilnius on November 29. 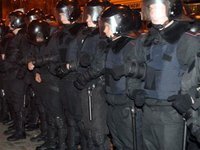 Berkut riot police units forcibly dispersed a rally of supporters of Ukraine's integration with the European Union on Independence Square in Kyiv at about 0400 on November 30. Thirty-five protesters were brought to the Shevchenkivsky district police department. A similar number of people were later reported to have sought medical attention. On December 14, 2013, officers of the Public Prosecutor's Office of Ukraine handed a notification on suspicion of abuse of power during the events at night on November 30, 2013 on Independence Square to Deputy Secretary of the National Security and Defense Council (NSDC) of Ukraine Volodymyr Sivkovych, Head of Kyiv City Administration Oleksandr Popov, the then Head of Kyiv police Valeriy Koriak and Deputy Head of Kyiv police Petro Fedchuk. On December 13, Popov gave his testimony. In his testimony, Popov said that on that night he received a command from Secretary of the National Security and Defense Council Andriy Kliuyev to follow orders from Sivkovych. The NSDC deputy secretary denied this. On December 14, Ukrainian President Viktor Yanukovych suspended Popov from the post of the head of Kyiv City State Administration. Sivkovych, Koriak and Fedchuk were also suspended.